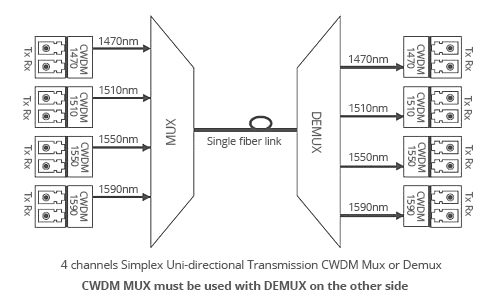 Demultiplexer (DEMUX) work with multiplexer (MUX) on the other side for single directional data transmission over one fiber. 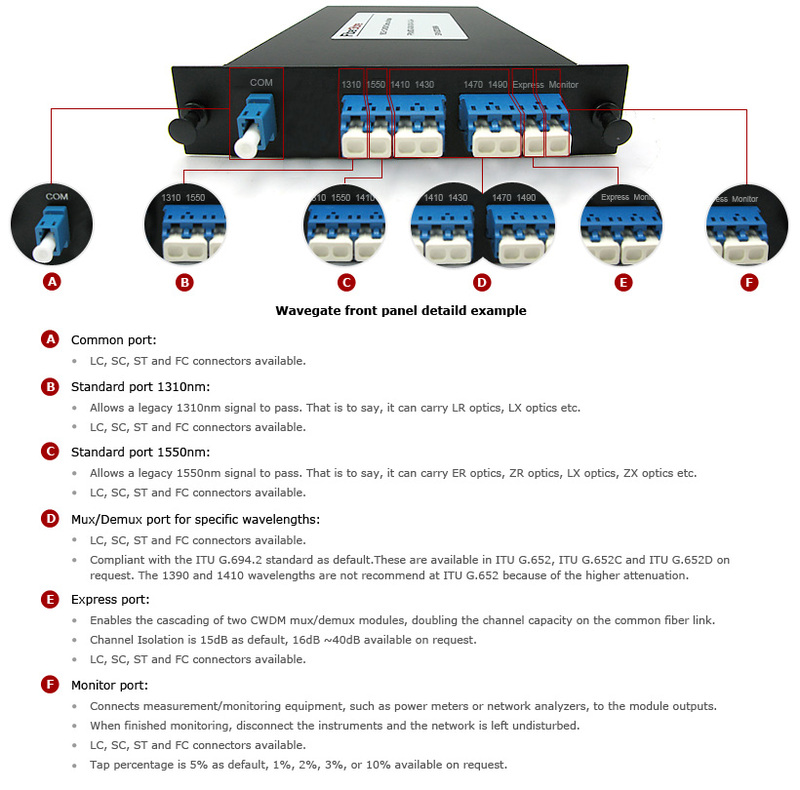 Fiber-Mart CWDM Mux/Demux is a passive technology, it allows for any protocol to be transported over the link, as long as it is at a specific wavelength (i.e. T1 over fiber at 1570nm transported alongside 10Gbps Ethernet at 1590nm). This allows for long-term future proofing of the networking infrastructure because the multiplexers simply refract light at any network speed, regardless of the protocol being deployed. Fiber-Mart provides a complete portfolio of CWDM Mux Demux and Optical Add Drop Multiplexer (OADM) units to suit all applications such as: Gigabit & 10G Ethernet, SDH/SONET, ATM, ESCON, Fibre Channel, FTTx and CATV. And we provide optional port configurations such as: Express Port, Monitor Port, 1310nm passband port and 1550nm port for these multiplexers according to customer choice. When using with 1310nm legacy SDH/SONET, CWDM wavelengths 1270, 1290, 1310, 1330 and 1350nm should not be used. When using with 1550nm legacy SDN/SONET, CWDM wavelengths 1510, 1530, 1550, 1570 and 1590nm should not be used. Please note that the drawings shown here only show the dimensions and do not the specific configuration of the module. Please also note that Fiber-Mart offers an innovative, robust Rack Mount Chassis for CWDM mux/demux, DWDM mux/demux , OADM unit and PLC Splitter LGX module for space saving and high-density applications.